NO bird  or for that matter, any creature  is at once revered and hated as crows are. In India they are literally invited to partake of meals after Shraddha (during this ritual Hindus offer food and water to their dead ancestors) for they are believed to be the messengers of the dead, if not the dead themselves. At the same time it is considered extremely inauspicious if a crow enters a house. If the bird sits on the roof of a house and caws that means some guest is going to visit that house shortly. In European countries, crows eerie croaking and cawing calls, have long been said to bring bad luck. They were thought to be the representatives of bad spirits. In olden times when human sacrifices, hangings and executions were very common, human corpses used to provide feasts for crows. These birds were thought to be sent by evil spirits, to feast upon and pay back the human victims for crimes they had committed. It was a general belief in many countries of Europe that a crow striking at window panes meant that it was summoning a human soul to the grave. Belonging to the Corvidae family crows, jays and magpies are the cleverest among all winged creatures. They are blessed with an excellent memory and even have ability to count. Ornithologists claim that they are even capable of talking like parrots, if trained. It is this intelligence and a remarkable ability to adapt that makes them successful in city and jungle alike. Crows show an amazing social consciousness. For example, in case of the death of a mate, the surviving individual is taken care of by other crows, often by a younger couple, who will bring food and generally look after the bereaved bird for a while. Predatory animals would think twice before raiding a crows nest. It would take seconds for the owner of the nest to organise a task force of other crows to attack and drive away the intruder. As far as intelligence is concerned, carrion crows have been observed learning how to open mussels. They pick up these shellfish from the shore, grab them in their bills, fly high and drop them on the rocks. The shells crack and thus the crows are able to reach the soft flesh inside. Herring gulls, a species of seabirds who copy crows do not seem to be so intelligent because many of them have been seen dropping mussels on soft mud instead of hard surface. Ravens, which are largest members of the order of Passeriformes or perching birds, are very clever and intelligent birds. Experiments with ravens and jackdaws have proved that there is a scientific basis to the above belief. It has been found that under certain conditions they can count up to five or six. They belie the popular notion that parrots are the most intelligent birds, instead they do far better than parrots, pigeons or any other avian creature. European nutcracker, a Eurasian bird, has a very good memory. This member of the crow family relies mainly on hazelnuts, pine seeds and acorns which it stores during autumn, when food is plentiful. Stored food is recovered and eaten during hard times, generally winters. It remembers where it has hidden its treasure. In winters European nutcrackers have been observed digging through snow 20 cm deep and taking out hidden food. 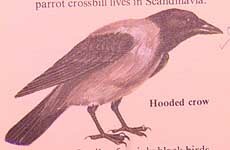 Crow, ravens, rooks and jackdaws are classified under genus Corvus which is a genus of typical crows. There are 40 species of these birds which are found all over the world except in New Zealand, islands of the Pacific Ocean and South America. In a majority of the species it is the female who incubates and the male feeds her during this period.